The dramatic opening of Star Wars. It was 40 years ago today, on May 25, 1977, that Star Wars first burst onto cinema screens, and from that time the world changed for the better. Star Wars introduced the world to Jedi knights with lightsabers, an evil empire building a moon size planet killer weapon, a rebel alliance with X-wing fighters and countless cool droids that were often smarter than their owners. Quite why Star Wars was such a massive hit has been debated ever since. It was clearly not for the dialogue. It was probably due to the fast-paced action. In fact, Star Wars popularised the notion that some films do not need opening credits, just an opening crawl to set the scene. Director George Lucas wanted the action to start as soon as the film did, and for audiences to be engrossed from the first few seconds. 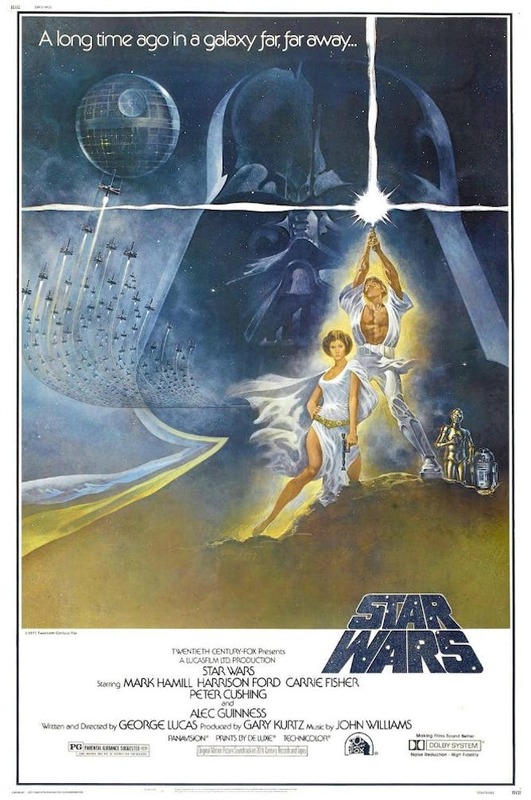 Star Wars was re-released in 1981 as a Episode IV: A New Hope. What made Star Wars different to the already loved Star Trek TV series was that Star Wars was not a prediction of our human future. Instead it was a story set in another galaxy in the ancient past. Some of us had our lives and careers shaped by Star Wars, and by longing to create the things we saw when we were young. Forty years on, who and what has been shaped by this revolutionary movie? The first Star Wars film was revolutionary in its depiction of high-speed battles between spaceships. Star Wars, one of the original film posters. The dog fights around the Death Star seemed so realistic, even though it was not obvious how some of the spaceships actually manoeuvred so well. When I took spacecraft design courses at university in the late 1980s (as part of my undergraduate degree), I did not dream that fellow Star Wars fans might one day be influential enough to actually design real spacecraft. We were taught that bringing a rocket back to Earth from space was impossible. I now realise that my lecturers were probably not Star Wars fans. The billionaire inventor and entrepreneur Elon Musk is one of those millions of mega Star Wars fans. He says that Star Wars was the first movie that he ever saw, and from that he has had an obsession with space travel and for turning humans from a single planet species into a multi-planet civilisation. In 2002, Musk created the Space Exploration Technologies Corporation, better known as SpaceX, with the stated aim of creating spacecraft to regularly fly hundreds of humans to and from Mars. Musk named his series of rockets “Falcon”, after Han Solo’s Millennium Falcon. And in 2017, a Falcon rocket became the first orbital class booster to return from space, land and later re-fly back into space. A SpaceX Falcon 9 lands after returning from space. Falcon rockets are named after the Millennium Falcon from Star Wars. In 2000, fellow billionaire inventor Jeff Bezos started his rocket and spaceship company Blue Origin off the back of his success creating Amazon. His New Shepard rocket was the first suborbital booster to return from space, land and later re-fly back into space. New Shepard rocket: takeoff and landing. Bezos is more of a Trekkie. He is so obsessed with Star Trek that he has even acted in it, appearing as an alien in the 2016 movie Star Trek Beyond. At this point, the Star Wars mega-fan (Musk) is ahead of the Trekkie (Bezos) in delivering commercial space flight with reused rockets. But only time will tell who will win. Star Wars introduced us to the Landspeeder. This is the car-like vehicle that Luke Skywalker uses to get to and from the family moisture farm, and which he sells so he can part-pay Han Solo to fly with him to the Alderaan system. Luke’s X-34 landspeeder is very much like a hovercraft that did exist long before Star Wars. But hovercraft are noisy and kick up a lot of dust, which is not great in the desert driving situations encountered on Tatooine! In 1978, a toy landspeeder was the must have toy, and I was lucky enough to have one. I still have it of course. The way it appeared to float across the floor on its highly sprung and hidden wheels was brilliant design. Subsequent Star Wars films such as Return of the Jedi showed us speeder bikes, and since then engineers have tried to replicate these amazing vehicles. Some great engineering efforts include the Jetovator speeder bike that works over water and connects to a jet ski. The makers were clearly inspired by Star Wars. The Jetovator speeder bike works on water. Others have recently created and tested hoverbikes that if they were fully commercialised would be very close to the speederbikes of Star Wars. One group have even made a speeder, the Aero-X, to test in the desert to ensure that Luke would be able to use it if need be. Remember Luke Skywalker’s Landspeeder in Star Wars? But for me, it was the droids of Star Wars that had the greatest impact. There can be no greater pair of onscreen robots as R2-D2 and C-3PO. They were perfect. Some original Star Wars scenes have been recreated in LEGO (with some modification). I have written before about Star Wars and robots. The vision that George Lucas and his team had in creating these robots (and the others that are found in the original 1977 movie) has had a major impact on robotics development, by inspiring many current day roboticists. We are beginning to see real high quality automatic translation services – something C-3PO was designed to do. We have medical robots, military robots and even farm robots. All of these were shown in Star Wars. Our present-day robots are not as capable as the Star Wars robots, but us roboticists are working hard to make that happen. It is unlikely that any film in the future will be as surprising as Star Wars was. It was new and exciting and surely that is one of the reasons for its success. But yet there are new Star Wars fans being born every day. It helps that many of their parents and grandparents are possibly also Star Wars fans, and that at the moment there is a new Star Wars film out every year. If the love of Star Wars is handed down the generations then who knows what it will have inspired in another 40 years’ time. The next Star Wars film is due out in December this year.